Netaji Subhash Mahavidyalaya had started its journey to meet the emerging need of students and local people. The establishment of Government College in Udaipur is the culmination of the dream of establishing a college of the people of Udaipur. The college began its journey in 1964 in purely private initiative by a group of people who valued higher education and wanted the children to attend college in Udaipur itself because of the high costs involved in studying at Agartala or any other place. Like all other good initiatives, this effort also experienced various ups and downs. By 1977 the Government of Tripura had come to the decision that a plot of land may be alloted to the college to start a Government Degree college. But the efforts went no further. The Udaipur Government Degree College was established in 21 September, 1979 with a humble beginning in a room in Kirit Bikram Institution with 35 students and 6 Arts stream subjects. A regular lecturer was appointed in 1978 in the Department of Economics. The foundation stone of the present college premise was laid in 19 March, 1984. In 1986, the college shifted from Kirit Bikram Institution to the present location. In addition to the Arts stream, the Commerce stream was established in 1987. The Science stream was started in 1997. On 23rd January, 1997 the college was named as Netaji Subhash Mahavidyalaya. Netaji Subhash Mahavidyalaya is the only College of Udaipur Sub-Division. Netaji Subhash Mahavidyalaya (NSM) is situated at the Udaipur Sub-Division of the Gomati District of Tripura. It is approximately 50 kilometers away from the capital of Tripura, Agartala. It is a co-education college affiliated to the Tripura University. The College received recognition from the University Grants Commission (UGC) under 2(f) and 12(B) as Netaji Subhash Mahavidyalaya on 31st March 2004. Udaipur (earlier known as Rangamati) was the Capital of Tripura during the Manikya period. The capital was shifted to Old Agartala by King Krishna Manikya in the eighteenth century, and then to the present Agartala in the ninteenth Century. Three famous temples of Tripura, Tripura Sundari temple, Bhubaneswari temple and Mahadev temple are constructed at Udaipur. The poet Rabindranath Tagore wrote his famous humanist novel Bisarjan in the backdrop of Bhubaneswari Mandir of Udaipur. Tripura Sundari temple integrates Tripura in the cultural map of India by making this mandir or temple one of the 51 Pithas of Shakti. This town is also called a town of lakes because of the large and beautiful lakes called dighis in local language which are located in and around the town like Dhani Sagar, Amar Sagar, Jagannath Dighi and Mahadeb Dighi. Udaipur is the second largest town of Tripura on the bank of Gumati river. It has a canopy of lush green foliage making the town a visitor’s paradise. Not unnaturally, therefore, it is one of the tourists’ destinations of the State. The town experiences moderate temperature throughout the year. The institute started its journey with a total number of 35 students and offered degree courses in six Arts subjects namely, Bengali, English, Sanskrit, Economics, History and Political Science and as general pass courses. More subjects had been introduced afterwards. At present subjects offered in the Arts group are Bengali, English, Sanskrit, Kokborok, Political Science, History, Education, and Philosophy. Subjects offered in the Science group are Physics, Chemistry, Mathematics, Botany, Human Physiology, and Zoology. Subjects offered in the intermediate group are Mathematics, Economics, Psychology and Physical Education. All subjects have both elective as well as honours options available with the exception of Psychology, Physical Education and Kokborok which can be taken as elective subjects only. The academic administration of the college is supervised by the Directorate of Higher Education of Government of Tripura. The academic curricula and examinations are regulated by Tripura University. Following the guidelines of Tripura University and Department of Higher Education, Government of Tripura, the College offers three self-financing courses – Bachelor of Computer Application (BCA) and Diploma in Computer Application (DCA) and Bachelor in Business Administration (BBA) in semester system. There is a Distance Education Study Centre in the college under Tripura University. At present, the centre offers UG general courses in four (4) Arts subjects – Bengali, Education, History and Political Science. The College also has an IGNOU Study Centre with the programmes – Bachelor of Arts (B.A. ), Bachelor of Commerce (B.Com.) and Bachelor of Preparatory Programme (BPP). 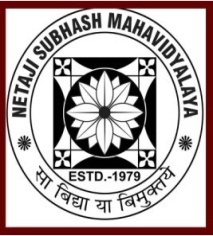 The vision of Netaji Subhash Mahavidyalaya is to provide inclusive education for inculcating human values, professionalism and scientific instillation to all sections of students including scheduled tribes, scheduled castes, other backward communities and religious minorities with special focus to female students.
? Affiliated to: Tripura University (which is a Central University), Suryamaninagar, Tripura.